Do you own a spa and finding it difficult to manage the various aspects of your spa? Well, Spa software can help you to handle everything from appointment booking to online and in-store sales, email marketing, payroll, reporting and much more. Whether you are a growing or fully established business, a spa software can be of great help you to increase customer loyalty, revenue and lower costs to run your operations more easily. But the task of identifying the right software for your business can be overwhelming, but it doesn’t have to be. What could be more effective other than email templates to promote Spa business in a right way? Below we have prepared a list of 10 best spa software that can take your spa business to the next level. So, let’s have a look. 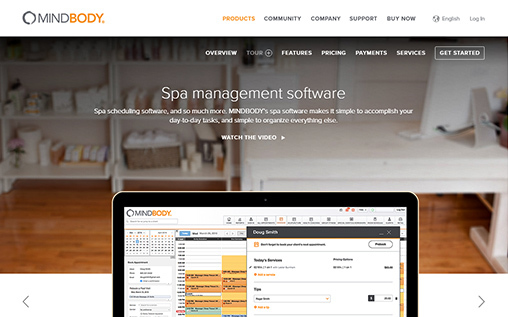 MINDBODY is a spa management software that offers full feature set for both administrators and clients. It has many tools specially designed for companies that offer personalized services, such as health spas, personal trainers, and fitness facilities. MINDBODY also provides additional Point-of-sale products and services to complete the customer experience, from check-in to checkout. It lets you set up wait lists, schedule recurring visits and book multiple clients at a single time. Group Calendar – You can easily see at a glance when your staff members are booked by assigning each of them a colour. Automation – It automatically sends a confirmation to the clients via text message, email or the MINDBODY app, whenever they book. Client Tools – Your clients get a unique profile where you can store their info like their birthday, contact information, a photo, visit and payment history, and more. Online Booking – Give your clients the freedom to view your schedule, book their spa service online, and even pay before they arrive. It can integrate with other business solutions for better promotions and scheduling, including Google Calendar, Microsoft Outlook, and social media accounts. It allows you to sell your products in person, online and in the app. Pricing – You can choose from various flexible plans, starting at $45 per month. Timely is the salon and spa software that streamlines all that time-consuming admin, so you can spend more time doing what you love. Access your bookings anywhere: work, home or on the go, with Timely’s native app built for iPhone, iPad, and Android devices. 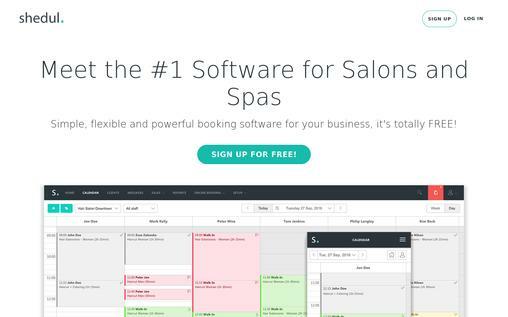 Timely Salon & Spa Software makes it easier to run your business, and integrates with your existing services such as Xero, MailChimp, Google Calendar, Afterpay, and more! Appointment calendar – Arrange client appointments with ease in our beautiful calendar. You control the view by staff, location, day, week or month. Online Booking – Clients prefer the ease of online booking. Timely’s online booking integrates seamlessly with your website, as well as Facebook and Instagram pages. Clients – Create personalized client profiles to hold all their relevant information including before and after photos, consultation forms, SOAP notes, and appointment history. Marketing tools – Automated SMS and email messaging is simple to set up and makes it easy to stay in touch with clients. Sales & stock management -Timely can manage your whole inventory, make sales, and even automatically order more products when you run out. Companion app – Run your business from everywhere with the Timely app, available on every device. Timely’s salon app is free for all Timely users, so your staff can download it to their phones too! Support – Our customers love our world-class support. Get set up for free and even import data from your old software solutions. Pricing – We have three package levels with the lowest starting at $15USD/month. There are no contracts and no hidden fees. 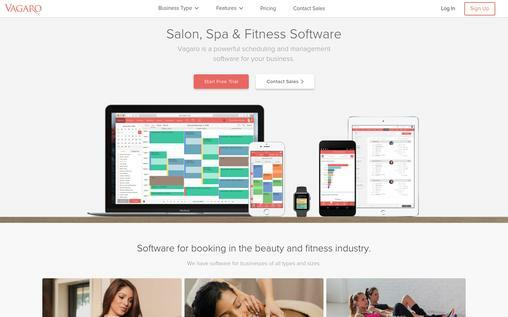 Vagaro is a powerful spa management software that works on any device. It provides many powerful tools that you need for your business such as marketing tools, POS, calendar, online booking, apps, customer tracking and much more. It is suitable for small spas, salons, booth renters, or multi-locations. Calender – View multiple service providers’ schedule on one screen with Vagaro Calender. It allows you to conveniently change your availability and reschedule appointments when required. Marketing – Get discovered by new customers by promoting your discounts with the daily deals and automatically sending birthday emails, reminders or follow-ups to your clients. Online Booking 24/7 – Get booked through Facebook, Vagaro app, Vagaro.com, Yelp, Google or your custom Vagaro website. Powerful apps – You get two powerful apps, one for your client and one for your business. Notifications – Send text, email, or push notification to your clients when they book or reschedules with you and make sure your clients never miss an appointment. Point of Sale – Get all equipment that you need to sell your products and services from your business. Reports – The dashboard gives you inventory, employee performance, payroll and custom retention reports in one place. Custom Website – You can create your own responsive website by using the custom spa website builder and allow your customers to book services, buy products and gift cards. Pricing – The pricing plan starts from $25/month. 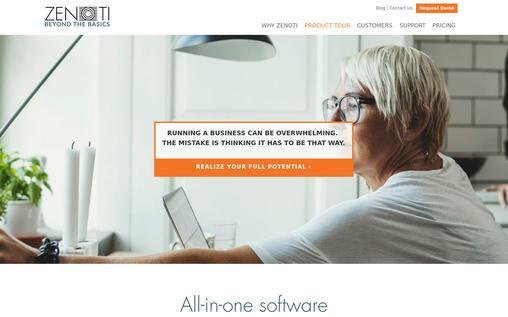 Zenoti is an all-in-one software for spas, salons, yoga studios, med spas and fitness centers, supporting multiple locations. It offers everything that you need to manage and grow your business including mobile apps for staff and customers, online bookings, data migration services, payments, support and training, gift cards, and reports. Membership and Packages – Set recurring payments easily for membership and packages. Allow your customers to book an appointment online or through the mobile app. Also, get the facility of group bookings. Billing – Get integrated credit card processing for fast and auto billing. Also, offer automated discounts and online or mobile app payments. Zenoti payments – Accept payments online, through your mobile app or via the POS. Also, you can charge a no-show or late cancellation fee from your clients with just a single click and get your full transaction fee back when you process refunds to your clients. Reports – Get custom reports to see exactly what you want. It helps you to manage your employees and stock easily. It offers automated and impactful built-in marketing tools to grow your business. 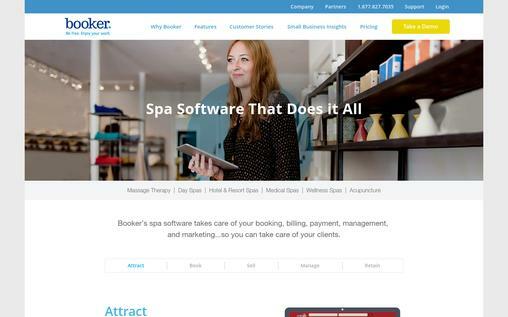 booker is a cloud-based spa software that manages all aspects of your business – everything from bookings, billings, and payments to management and marketing to grow your customer base and retain those customers over time. Also, it gives you mobility to you and your staff to perform essential business tasks from anywhere through its mobile app. Bookings – Booker’s online booking page integrates with your existing website allowing you to accept an online booking. Also, your clients can book you from Facebook and even on their mobiles and Tablets while on the go. Scheduling – The scheduling feature allows you to view your daily appointments, available time slots and description of your services. POS – Booker’s POS software connects with your credit card processor for processing real-time transactions. Also, you can turn your turn your smartphone or tablet into a payment terminal for payment processing. Inventory Management – Easily manage your inventory for both online and in-store sales. Marketing – Get the ability to create and publish special offers to current and prospective customers on social networks. Also, you can use a booker marketing network to get your book filled during slow periods. Reporting – Get real-time reports of bookings, sales, inventory turnover, customer behaviour and marketing campaign performance. It offers many amazing features to retain your customers, such as email marketing, customer loyalty programs, membership programs and customer surveys. Pricing – The pricing plan starts at $85/month. 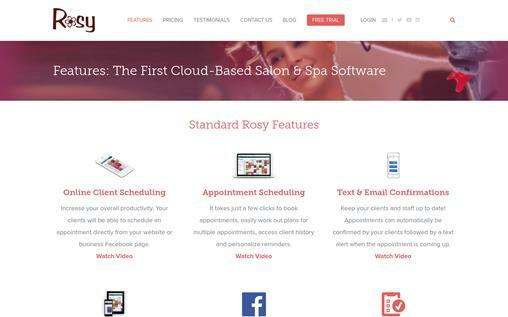 Rosy is a web-based salon and spa software that enables professionals in the beauty and fitness industry to schedule appointments and improve their customer engagement. This software is suitable for small to midsize business. Online Client Scheduling – Allow you clients to schedule an appointment from your website or through your Facebook business page. 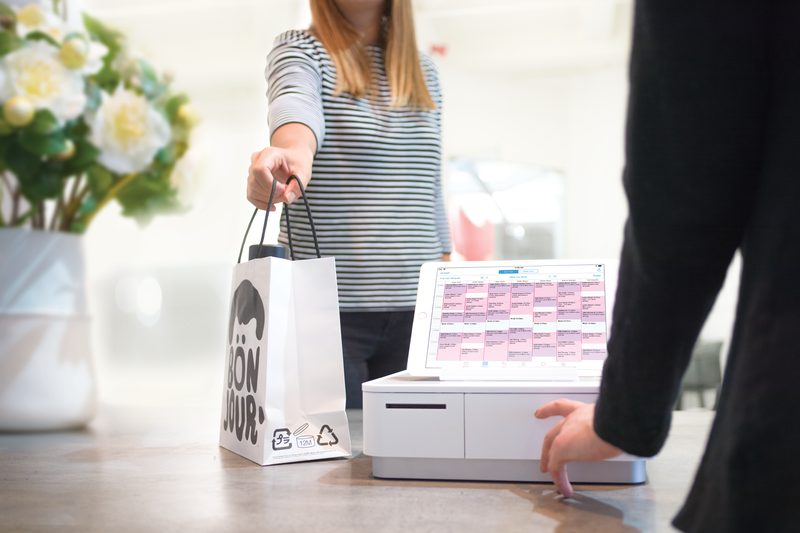 Point of Sale – Enjoy fast, easy and secure checkout of clients. And manage gift cards, cash drawer and different types of transaction without any hassle. Mobile Access – You and your staff can view and manage the appointments on their smartphones or other wireless devices like tablets. Facebook Integration – Allow your clients to manually fill any cancellations through your Facebook page. Rosy allows you to create a mobile-friendly site that your clients can access from their mobile device. Inventory Control – The inventory management feature lets you know when you are running low on products. Reporting Engine – The reporting engine includes more than 60 different reports and advanced filters to customize reports according to your needs. You can take a free trial of 30 days with 24/7 tech support and no contract. Pricing – The pricing plan starts from $29 per month. 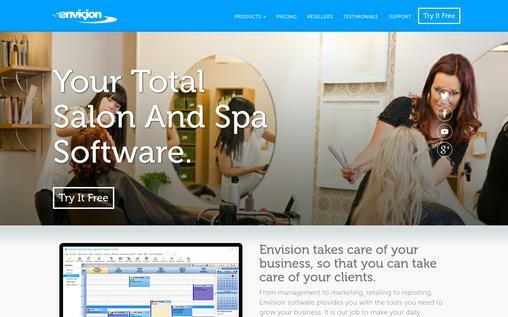 Envision is your total salon and spa software that takes care of your business so that you can take care of your clients. From marketing to management, reporting to retailing, this software provides you with all the tools that you need to grow your business. It is available in both cloud and desktop version. Online Booking – Allow your customers to book from website or Facebook. Also, you can sell gift certificates online. Online Access – Access your date from anywhere with the iPhone and Android Apps. Book appointments, view real-time sales date and check inventory levels from any web-enabled device. Automated Appointment Confirmations – You can set Envision to automatically send SMS or email confirmation to your clients up to 3 times before their scheduled appointment. Use the waiting list to quickly fill canceled appointments by keeping track of clients available for last minute appointments. Pricing – You can choose from the flexible pricing plan, the subscription plan starts from $25 per month while the purchase plan will cost you a one-time fee of $795. 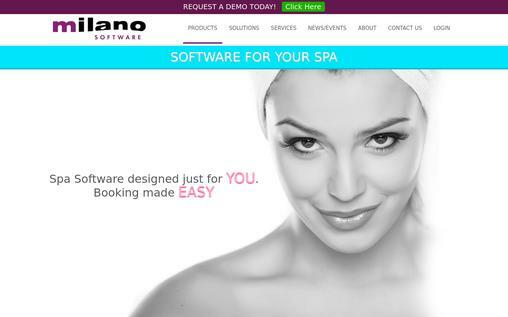 milano software offers a simple and versatile spa software for easy bookings. It offers various dynamic and effective features for booking, marketing, and CRM to grow your business. It also offers a hassle-free payment system to make checking out a breeze. Booking – Set up unlimited appointments quickly and easily. Also, handle those last-minute walk-in clients with no trouble. CRM – Invite your clients to special events, reward them using the advanced loyalty program, and manage all your clients in one place through the CRM. Marketing – Use the marketing tools to send automated emails for appointments, target emails to the specific clients and track your various email campaigns. POS – The POS allows you to integrate cash registers, track gift cards, and create and customize your receipts. Automated – Automatically send reminder emails and notifications to your clients. Streamlines Payroll – Get detailed and summarized payroll reports. Watch your earnings in real-time with revenue monitoring tool. Mobile App – The mobile app for staff allows you to check and edit client information and appointments and it allows your staff to check their schedules. And the app for guests allows your clients to access important information, book and confirm their appointment, and purchase gift cards from their smartphone or tablet. 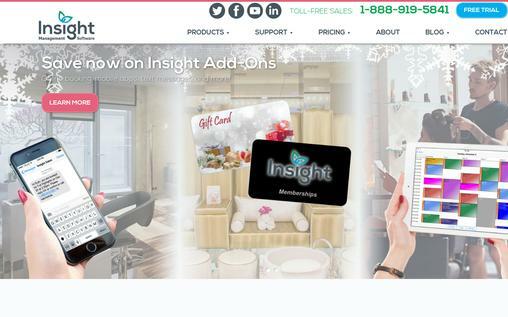 Insight is a feature-rich salon and spa software that works as your virtual assistant, marketing manager, bookkeeper, business coach and much more to help you to efficiently manage your business. It allows you to manage appointment schedules, online bookings, staff members, client information, payroll, inventory and retail sales. Appointment and Staff Management – Do fast and easy scheduling and move appointments by using drag and drop option. Also, manage staff scheduling, payroll, track sales, performance and time clock. Business and Client Management – Store client information and track referrals from existing clients. Get the ability to track products, services and appointment history. Remote Access and Online Backups – Insight’s remote access service allows you to manage schedules, reports and everything from wherever you want. And keep your data safe and secure with its online backup service. POS – The POS integrates with your existing payment option to process any credit card and handle multiple payment methods. Mobile App – Allow you staffs to edit and cancel their appointments on their mobile. Online Booking – Allow your clients to schedule an appointment on your website 24/7. Text and Email Confirmation – Set up an automated or manual email or text message to confirm appointments, replace last minute cancellation, advertise special offers and more. Reporting – Get over 80 reports to analyze sales, clients, appointments, inventory, employees, and management. Pricing – The pricing plan starts from $35/month. 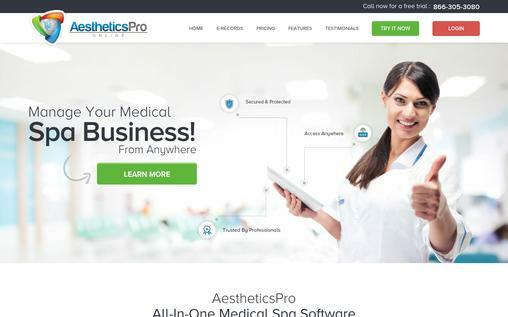 AestheticsPro is an all-in-one medical spa software that can be accessed from anywhere. It is HIPAA-compliant and suitable for medical spa industry. It allows you to safely and efficiently manage all your electronic medical forms. Calendar Suite – Unlimited calendars helps you to schedule and track all your clients’ appointments by room, provider and/or equipment. Client Portal – Allow online booking, view E-Records, notes, charts, before/after photos, purchase history invoices, services remaining, and outstanding balances all within a single client portal. POS Suite – The fully integrated payment systems that allow you to seamlessly invoice clients for services scheduled and provided. Marketing Suite – Instantly track your leads, ROI and marketing costs. E-Records – Create and manage medical records such as client files and photos in seconds. Manage Clients and Leads through the intuitive interface. Pricing – The pricing plan stats from $69/month with free setup, training, and unlimited online support. shedul is one of the best salon and spa management software which is totally free. It offers all the great tools and advanced features that you need to run your spa, salon, and wellness business. With the user-friendly activity dashboard, you can easily keep track of daily activities. The dashboard displays all the bookings, actions and notifications in one place. Manage Clients – Manage your client’s detailed appointment history, future bookings, preferences, and contact details to maintain relationships. Automated Reminders – Send custom messages and automated reminders about their appointment and notify them of any changes. Schedule Appointments – Handle all your salon bookings with the powerful calendar. Online Bookings – Allow your customers to book your services online through your website, Facebook or other widgets. Built-in POS – The built-in point-of-sales takes care of your sales transaction, receipts, invoicing, tax and product management. Pricing – shedul is free for everyone and is available for unlimited use. Spa management software helps you to manage your day to day tasks in a simplified manner with the help of online booking, POS, appointment management system, etc. With the right approach, you can save your time and find the best spa software for your business that will simplify your task and make you stress-free. And even if you don’t know what is the right source to get started with the marketing of your business. Try out MailGet Bolt – Email Marketing Service For Massage Parlor & Spa Salon, an effective & high functional email marketing software which allows you to send bulk emails in a single click. Out of curiosity, how come Book4Time is not part of this list? Did you know it’s the software used by Hilton, Four Seasons, Hyatt, Shangri-La (as exclusive provider), just to mention some of them. What factors you consider to generate this list?